MARTA runs hundreds of buses over 91 routes covering over one thousand route-miles. Bus times vary by individual route, so be sure to check the schedule for your specific route. Customers are allowed to bring bikes on buses that are equipped with a bike rack. Learn more about bikes and MARTA. All buses are equipped for wheelchair access, but special Mobility access is available. All customers are required to have a valid Breeze Card/Ticket loaded with appropriate fare to ride MARTA. Transfers are only available on a Breeze Card/Ticket and are automatically loaded when you tap to board a bus or exit a rail station. If you pay with cash, you will need to load your fare onto a Breeze Card/Ticket to receive your transfer. Transfers cannot be used for round-trip travel. You are allowed 4 transfers within a 3-hour period. MARTA has hundreds of buses in service throughout the network, covering over 103 routes. In 2014, MARTA upgraded its fleet with 200 New Flyer buses, increasing passenger comfort and fuel efficiency. MARTA Mobility is a program for eligible persons with disabilities who are unable to board, ride or disembark from an accessible vehicle on MARTA's regular bus or rail services. 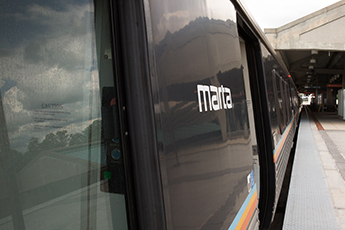 To learn more, view our Accessibility & MARTA Mobility page.